CC badges now quite useful? With the new addition of the Razor trait are critical chance badges now useful on melee characters, specifically warriors? Normally I use 3 DR and 3 damage badges but now I'm wondering if adding a CC badge is worthwhile. What are ideal melee badges now? They've always been useful if you know how and when to use them. They are ideal candidates for ranged survivors with Sure Shot trait and Piercing on weapon, Hunter using the RPG, melee with Razor traited weapons, etc. Sometimes they are even beneficial on Assault for charge attack, which is a guaranteed non-body shot. I could see putting 1 or 2 on an offensive Assault being used in conjunction with a defensive Assault. The offensive Assault MUST have Piercing on weapon. Critical chance does become more usefull for melee, especially on warriors. But scouts can benefit too. And well, bruisers too I guess (if you use them to kill). Asuming you do high level play! Up to 4 lvls above your survivors it already was pretty good to have. In very high lvl play. Is that true? isn't it 55% bodyshot and 45% non-bodyshot, not any guaranteed crit? Crit Chance cap is 90%. In 45% of the time it is non-bodyshot for gold razor. 90% of 45% is 40.5% chance at crit. It can't be crit unless non-bodyshot. But when non-bodyshot is achieved it can be. Your an awesome benefit to the NLM community!!!! ah, ok. didn't realize you were already taking the 90% into account. what is the default chance? if I add a 18% CC badge with no other increases, what is my actual crit chance? I believe default chance is 10% for all classes except Warriors assuming no bonus effects and assuming you are playing at a level below guaranteed body shots. 20% chance for Warriors under same conditions. I'm actually considering removing a damage badge from Michonne and dropping a legendary critical chance badge on her. I'll have to sacrifice about 12% of her damage but cc badge with bonus will be adding 25%. Of course I'm waiting on a weapon with razor for her. It took me awhile to make the jump to Sasha with 80% DR but after getting used to it there's no way I'd go back. It's significantly improved how far I can get in the challenges and she doesn't drop like a wet rag if hit in the distance. That's exactly what I'm debating @Cronus ... my default for warriors has been 3 damage badges than a combo of health/DR (depending on what I had available), not sure what to do now. I won't be taking off a DR badge that's for sure. I always get to the point where I can't one shot kill anyway so taking damage off just makes that happen sooner. That's where the critical chance and razor trait will make a difference so I'm willing to give it a try once I have the right weapon. It seems there is 10% cc, and now 20% for warriors. Luck just adds to that, so 40% luck can bring it to 50 or 60. Then powerstrike can finish it of. Accurate on a weapon too. 20% inherent on warrior, 10% on others. Leadership by carol is huge. I know the buff for crit chance on warriors has me rethinking use of the survivors below. I had been more of a proponent of dodge over lucky so have been sitting on them along with almost 6,000 warrior tokens. Now I'm thinking it's time to promote one of them since lucky is additive with crit chance. Lucky on a warrior weapon will be better than accurate (lucky gold/silver 20%/15% vs. accurate gold/silver 15%/10%) so believe I'd target silver lucky, gold wide arc and gold razor. Any of these warriors still need a crit chance badge based on that (20% base, 15% silver weapon lucky, 20% lvl 6 survivor lucky) but I can hit 80% with a legendary badge. I like the idea of powers trike (have a 7 star warrior with it already) however for general game play think I'd rather guarantee my crit chance rather than have to rely on no movement. @Cronus I think accurate got a buff recently. It's 25% and 20% for gold/silver. @jimmorrison369 makes a good point about maxing crit chance on warriors but since Michonne has neither power strike or lucky a CC badge makes complete sense on her. Plus it means you can have good crit chance without having to sacrifice a weapon slot. I'm currently building out my first scout weapon with silver accurate (20%), gold luck (20%) and gold razor (45%). 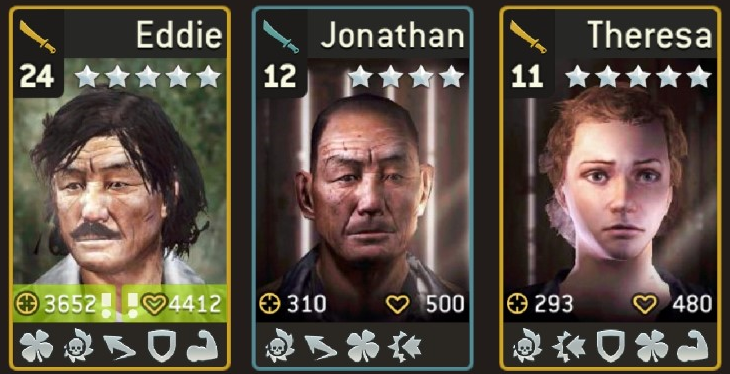 I'm planning on pairing the knife with a 7 star survivor with 20% luck and powerstrike and was wondering how luck interacts with Razor. That's a shame, but I understand why.